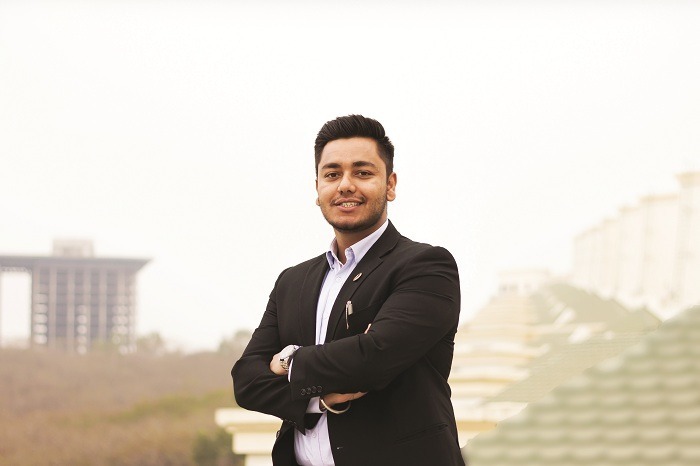 Back after taking a dip in the holy Sangam at Prayagraj during the ongoing Kumbh, Satyajit Mittal spoke to Sourcing Hardware about his award-winning product SquatEase, which earned him kudos from Prime Minister Narendra Modi himself. Mittal, who’s a product and experience designer, had in 2016 designed an Indian pan that makes squatting much more comfortable, besides solving a gamut of hygiene and behavioural issues. So innovative was his design that it earned him the iF Public Value Student Award in 2016 and Swachh Bharat Puraskaar in 2018. Buoyed by this success he established his startup Sanotion, which in association with World Toilet Organisation is driving change in the rural belts of the country where open defecation is a challenge still to be addressed. Sanotion has recently supplied around 5,000 SquatEase pans to the Prayagraj Mela Authority. In 2016 was in the final year of my degree programme at MIT Institute of Design, Pune, and around the same time, the Prime Minister of our country was spearheading the campaign against open defecation. I invested some time to research about the widespread practice of open defecation and found that besides being a major source of contamination of India’s freshwater resources, it also causes severe illness among millions of people across the country every year. I roped in some friends to help me take a survey and the conclusions were startling – the problem was not just a lack of access to toilets but also a disinclination to use them. As a curious student of product design and an observer with a passion to find creative solutions, I saw an opportunity where I could make a contribution. It was precisely this thought that led me to develop SquatEase, which I believe will not only help increase the use of the squat toilet (the proverbial Indian WC) and lead to improved sanitation but will also go a long way in reducing open defecation. In fact, for the last two years, I have been researching, analysing and developing innovative products to improve sanitation related problems with an aim to help rid the world from open defecation and provide good quality sanitation for all. 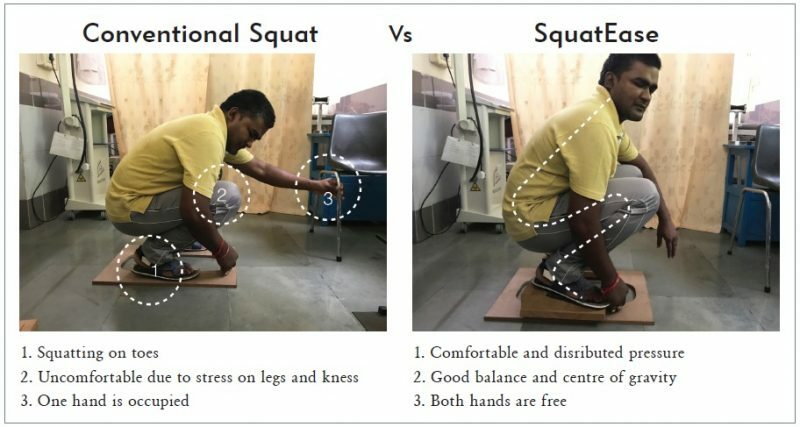 If you look at the commonly available squat toilet, it is a challenge to use, as holding the balance while in a squatting position puts a lot of stress on the knees. It is all the more difficult for the elderly and, over the years, it can cause knee problems. My friends helped me out by taking various images of squatting while we were working on the design aspect. The general observation was that while squatting, many people prefer to sit on their toes with their heals raised. This shifts their centre of gravity forward, making a more stable stance that reduces the risk of falling backwards, compared with squatting flat-footed. At the same, the heels-up posture reduces the area of contact between the foot and the floor, thereby placing greater strain on the knees to maintain balance. This is where our product with its patented design comes into play. SquatEase is a clean and comfortable toilet solution. What we have done is that we have introduced inclined planes on the footrest. This ergonomically angled footrest helps the user to squat easily without any pain as the footrest divides the pressure on the entire foot instead of the toes, thereby reducing the pressure on the knees. It also resolves the problem of falling backwards. The inclined footrest plane features a big-ribbed design for better grip. Also, SquatEase has been designed for special needs – the markings on the floor of the footrest guide the visually impaired to gauge the slope and where to squat. The inclined plane makes it the first ever uni-directional squat toilet; the uni-directional aspect invokes behaviour change as the user is forced to squat in the correct direction. The automatic correct positioning of the user ensures that no mess is created, and the pan is cleaned by using lesser water. In February 2016 I showcased this product at International Forum of Design where it was awarded the iF Public Value Student Award 2016. SquatEase was displayed, presented and widely appreciated at the International Design Museum in Munich, Germany. More recently, we’ve received the Swachh Bharat Puraskaar 2018, the top prize for innovation awarded at the Mahatma Gandhi International Sanitation Convention which was held recently in New Delhi. Over 1,000 innovations were presented as part of the competition, out of which 55 were screened by industry experts who were facilitated by Water Supply and Sanitation Collaborative Council (WSSCC) at UNDP, Delhi. Following the screening, 17 shortlisted entries were asked to make a live demonstration/presentation at the UNDP Office in New Delhi in front of a jury, which consisted of top-level executives from Ministry of Drinking Water and Sanitation, UNICEF, World Bank, Water Aid, and IIT-Delhi. Five finalists were selected to make an elevator pitch to a jury chaired by Dr R A Mashelkar and consisting of Dr Bindeshwar Pathak, founder Sulabh International; Sue Cotes, WSSCC; Robert Chambers, British academic and development practitioner; and Peter Harvey, Chief UNICEF. Our innovation SquatEase was awarded first place by the jury. More recently, we have supplied over 5,000 SquatEase pans to the Kumbh Mela 2019. I personally made it a point to stay there for a few days and conduct a survey on what the common users had to say about it. SquatEase has also featured at the ‘Toilet Cafeteria’ at the Kumbh in Prayagraj, which is aimed at promoting sanitation.